We made it to Bryce just in time for a quick hike around the Navajo Loop Trail before catching sunset at the famed sunset point. We watched the sky change colors over the expansive landscape of red and orange hoodoos. Our next destination was Zion National Park, about a two-hour drive from Bryce Canyon. We booked a room at the adorable, locally owned, and eco-conscious Two Cranes Inn, which placed us only a ten-minute drive from Zion’s visitor center; super convenient! We dug the communal areas of the Inn which included a kitchen, well-stocked with cooking necessities, and cozy living room complete with a bookshelf for leaving behind/trading books. The views of towering red rocks from the kitchen windows were an added bonus. The Inn has many personalized touches and is decorated with tons of artwork and artifacts from the owners own travels. The zen décor evoked a feeling of peace and tranquility. The owners deep care for the Inn is apparent in the thoughtful and considerate little touches from the coffee table books to the Tupperware provided for each room to pack lunches for hikes in the park. They’ve really thought of everything to make their guests feel at home! Worried that it may be too cold to hike The Narrows in November we headed to the Visitor’s Center to ask a few questions. They recommended a gear rental place and assured us that with the proper gear hiking was totally do-able. 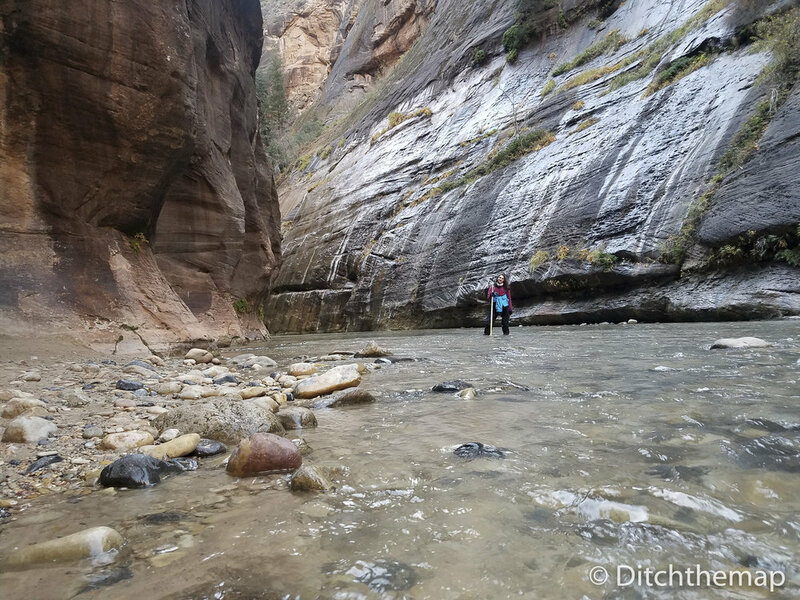 Outfitted with waterproof pants, canyoneering shoes, neoprene socks, walking-sticks, and several layers of warm clothing we set out on the park shuttle for the narrows the following morning. Depending on how much gear you rent you can expect to pay between $35 and $65 per person for a full set-up. The gear rental places conveniently offer packages to include everything you need for the narrows (socks, shoes, walking stick and water proof clothing). A waterproof pant set cost us $45 and the full dry suit set cost $55. In retrospect, the full dry suit, which includes covered torso and arms, turned out to be unnecessary because the water levels weren’t too high and the temperatures not too cold. Although prices are largely uniform you may want to shop around for the best rate. While we were both skeptical that we would actually stay warm in the 40-degree water, the gear did its job! Though our feet were wet for the entirety of the 4ish-hour hike, the water heated up to our body temperature inside of the neoprene socks. We were both quite warm and comfortable, despite the lack of sunlight in the canyon. The first half of the hike required passing back and forth across the water several times. 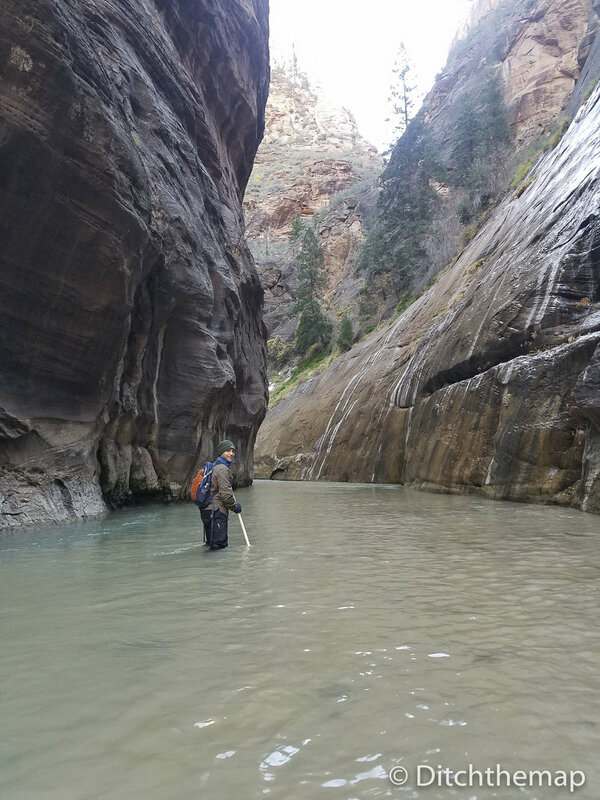 As we hiked further into the narrows we spent more time in the water, up to our knees and thighs at points, pushing against the current and strategically placing our feet among the rocky bottom, using our hiking poles for leverage. The feeling of adventure and seclusion made for an outstanding hike. We were thankful to start the hike in the morning to beat the crowds. 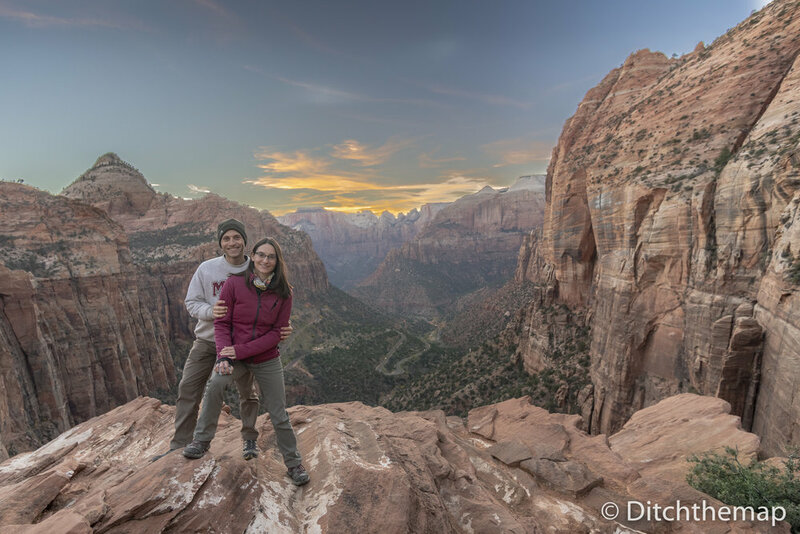 The notorious Angel’s landing hike is esteemed for it’s dramatic views and chained railings along sheer drop-offs. The hike isn’t a long one but it is steep and not for the faint of heart. After the initial hike upward utilizing dozens of switch backs to gain about a 1,200 feet in elevation, you reach the “fun” part. Pulling yourself upward using chained handrails you work your way closer to Angel’s landing, the exposed 5,790 feet rock outcrop. The difficulty of the second half of the hike is remembering to not psych yourself out by looking down. Also, maneuvering your body carefully to allow those hiking down to pass you while you both grasp the chain railing can be a tricky at times. That said, it is truly an exhilarating hike!